Nike ID has allowed shoe buyers to customize a shoe that perfectly fits with what they need to do. Whether it's running, playing sports, or just for everyday needs, they have a shoe that will work for you. You can expand that task category to include Pokemon Catcher, thanks to an Instagram account called Poké ID. The account has matched a variety of shoe types that include the Nike Hyperdunk 2016, the Nike Zoom, the Kyrie 2, the Nike Zoom Lebron Solider, and the Kobe XI Elit, with their corresponding Pokemon. The results are at times fantastic, and some highlights include the Charmander's (004), the Poliwhirl's (061), the Pikachu's (025), and the slick green tinted Metapod's. The royal blue Blastoise's (009) also impress, and surprisingly so do the Magikarp's (129). Sadly, impressive and Magikarp rarely go in the same paragraph, let alone the same sentence. You can submit your shoe designs to Poké ID's Tumblr account, and they'll add it to their impressive collection. The designs are focused on the original 151 Pokemon, but at some point, they will assuredly start working on some of the newer additions. 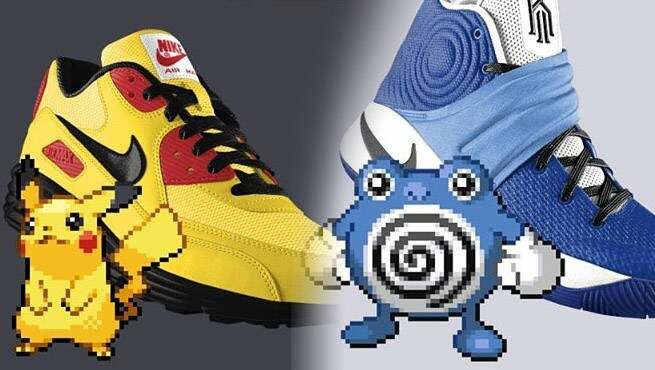 Don't be surprised if very soon you happen upon some Poilwhirl or Bulbasaur themed shoes when you're walking down the street. There's an impressive collection already on the page, so let us know which one happens to be your favorite. You can find some of our favorites in the gallery, and if you're feeling adventurous you can always customize your own on the official Nike ID page.